Why Add In-Office AR To Your Practice? The patient benefits of AR coating are undeniable. By minimizing surface reflections AR coating improves vision when dealing with overhead lighting, computer screens and window glare. Vision during night driving is also improved reducing the glare of oncoming headlights. 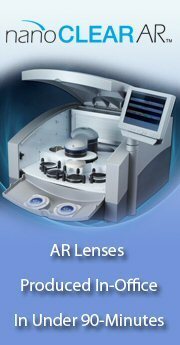 AR lenses are more cosmetically appealing for improved patient appearance. Not offering an AR option is a missed opportunity to improve patient satisfaction and even more importantly, a missed opportunity to grow your practice profitability. Past barriers to providing an AR option such as quality, delivery time and cost, are eliminated with the in-office nanoCLEAR AR unit. Designed for use with your Q-2100 Digital Lens System, the nanoCLEAR AR unit processes lenses that are anti-reflective with a hydrophobic/oleophobic top coat in under 90-minutes. Using nano particle technology, our breakthrough design is a small table top system that easily installs in most offices. It is clean quite and automated for easy operator integration. Priced about the same as an edger, the nanoCLEAR AR unit is an affordable and profitable addition to any practice.